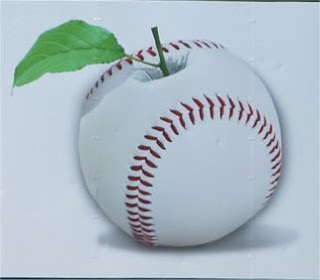 On Monday, after we worked outside a bit in the yard with my In-laws (nothing major, just planting large pots of jasmine, spreading out 40 bags of much, trimming hedges, watering flowers, and pulling weeds) we were off to a baseball game. 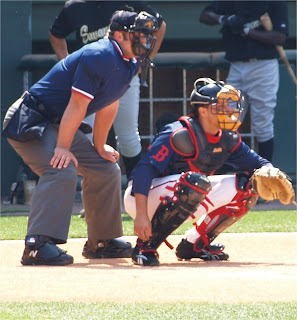 Our team (Greenville Drive) is a Class A team and is affiliated with the Boston Red Sox. 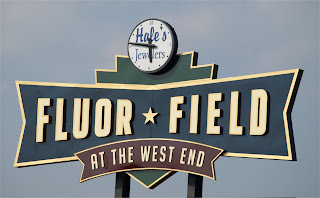 The field is located right downtown and is exact mini replica of Fenway Park in Boston. When the new team was formed and renamed, my DH was tickled pink with the new affiliation. You see he has been a Sox fan since he was a kid and now his son (Spencer) is too. The afternoon was beautiful, quite warm (86 degrees) and we were ready for some fun! I have to admit, I am not a baseball fan in anyway, shape, or form. I try really hard to watch (in person is better than TV) but it really is not my cup of tea. Now, give me an ice hockey game or perhaps a football game and I am all for it. There was a great turn out for the game and everyone there was really into cheering for the team. 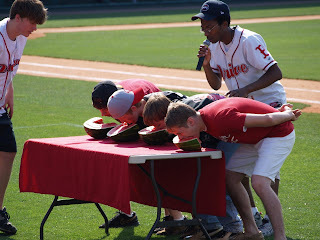 One of the big hits (pardon the pun) between innings was watching the watermelon eating contest. The Drive lost, (happy to say that they did win on Tuesday to break their losing streak) which was tough to watch for they were really playing well. 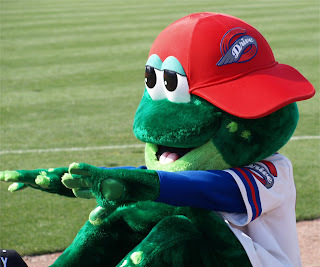 Below is Reedy Rip'it our mascot. He was named after the Reedy River that goes through Greenville. A day of good family fun and memories.